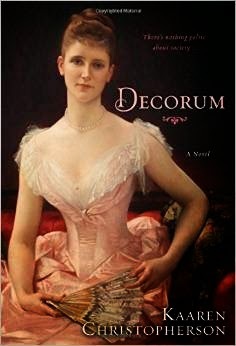 Kaaren Christopherson's brilliantly observed novel captures the glamour and grit of one of the world's most dazzling cities during one of its most tumultuous eras--as seen through the eyes of a singularly captivating heroine. . .In 1890s New York, beautiful, wealthy Francesca Lund is an intriguing prospect for worthy suitors and fortune hunters alike. Recently orphaned, she copes by working with the poor in the city's settlement movement. But a young woman of means can't shun society for long, and Francesca's long-standing acquaintance with dashing Edmund Tracey eventually leads to engagement. Yet her sheltered upbringing doesn't blind her to the indiscretions of the well-to-do. . . Among the fashionable circle that gathers around her there are mistresses, scandals, and gentlemen of ruthless ambition. And there is Connor O'Casey--an entirely new kind of New Yorker. A self-made millionaire of Irish stock, Connor wants more than riches. He wants to create a legacy in the form of a luxury Madison Avenue hotel--and he wants Francesca by his side as he does it. In a quest that will take her from impeccable Manhattan salons to the wild Canadian Rockies, Francesca must choose not only between two vastly different men, but between convention and her own emerging self-reliance. New York, 1890, and the glitz and glamor of the time and setting, are the backdrop for this novel about a young heiress who suddenly finds herself alone in the world. I loved how each chapter began with a rule of etiquette based upon the societal norms of the time. The story gave me a glimpse of what it would have been like to live among the wealthiest and most prominent citizens. Of course, all is not perfect, for the heroine must maneuver her way through treachery, greed, and scandal to find which of the two men in her life is her true love. I thoroughly enjoyed how the characters interacted, and how authentic they felt to me. Lots of wonderfully rich descriptions of places and gowns really brought the era to life. There were an awful lot of characters and this always causes me to struggle a bit to recall them all. At times, I had to flip back through the pages because some scenes did not make sense, and I wish it had been edited a little more to ensure clarity. I definitely recommend this book to anyone who enjoys New York in the Gilded Age. A good historical read!